The information and worksheets in this publication will help you get started on creating a plan for transferring your estate. We had in mind helping Wyoming agricultural operations transition to the next generation, but the techniques and tools can be used by small businesses and individuals. To make it easier for you to access and reuse the worksheets discussed in this publication we have provided them and an Excel® spreadsheet for creating a personal financial statement. We encourage you to begin conversations on the future of your family business early, and to revisit the goals you agree to and the documents you create regularly. Having regular discussions about the future of the operation before the senior generation starts planning their estate will make transfer decisions easier. We’re happy to answer questions and to talk with you or your group. Note that some legal information, especially on the federal estate tax, is no longer current due to changes created in the Tax Cuts and Jobs Act of 2017. 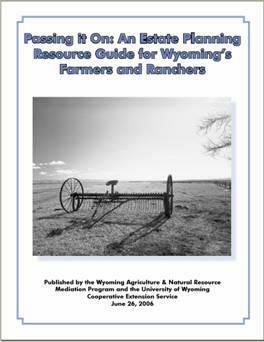 The handbook is a publication of the Wyoming Agriculture & Natural Resource Mediation Program in conjunction with University of Wyoming Extension. The Passing It On resource guide is intended to provide general information on estate and succession planning. It is not intended to substitute for competent legal advice. Alan Schroeder retired in 2013 from his position as an Associate Professor with the Department of Agricultural and Applied Economics at the University of Wyoming. His work specialty was in agricultural and natural resource law, on which he spoke and wrote widely.